I was so excited to meet the young mother who bought this for her little girl. She wanted to give it to her for Christmas but they were in the process of moving and was worried about it possibly being damaged. And as we talked, I mentioned that it would be a bit of a disappointment to get your Christmas present so far from the actual date. I offered to hang onto it for her until it got closer to the holidays. This was a young mom who you just knew loved her little girl beyond words. She was such a joy to spend time and speak with. She was having a bit of a bad day, and wanted to be of some help or at least comfort. Which is why I offered to hang onto the vanity. In the resulting weeks, I also thought periodically about all the ‘little girl’ things I never had a chance to make since I had just one child, a son. So, in spare time I put together a couple of things for her. The first project was just one more in a long line that I had been playing with. I have been a big fan of Plaid’s Gallery Glass paints… when used on glass, it results in a stained glass look. I’ve done a few gallon jars and then filled with Christmas lights, resulting in nice ambient lighting. The one in the center(ish) is the newest and the one I used as a model for the one I made for Anne’s daughter. I also made a slightly smaller version using battery powered lights, as the Christmas lights tend to be on the warm side and I worried about it being too hot. The smaller one can be handled safely by her, while the larger one can be placed out of her direct reach. I have a couple of finishing touches left before I can reveal the other gift I made. I hope you come back to see what (essentially) an afternoon without a specific goal can produce! A few more pieces of pink. I hope you can stand it. Just a little more. 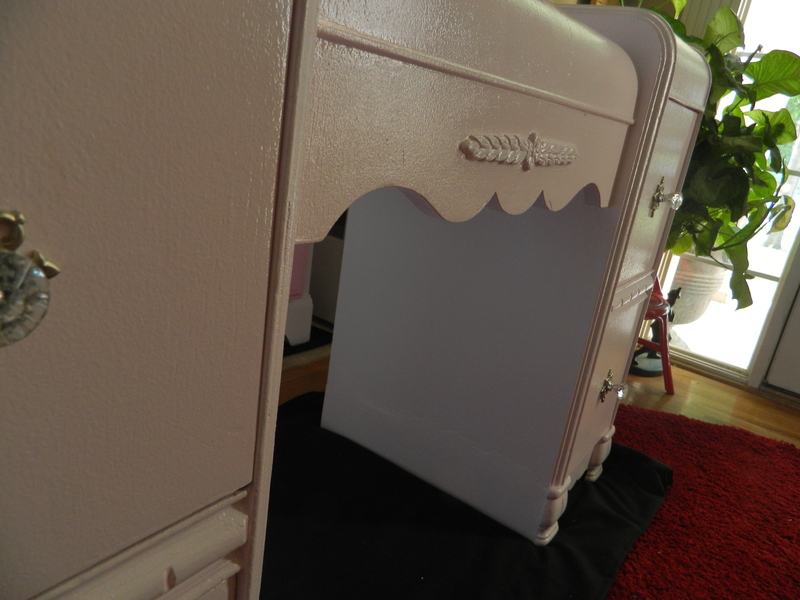 I repainted the night stand (shown on the most left in the photo above) to match the other night stand. 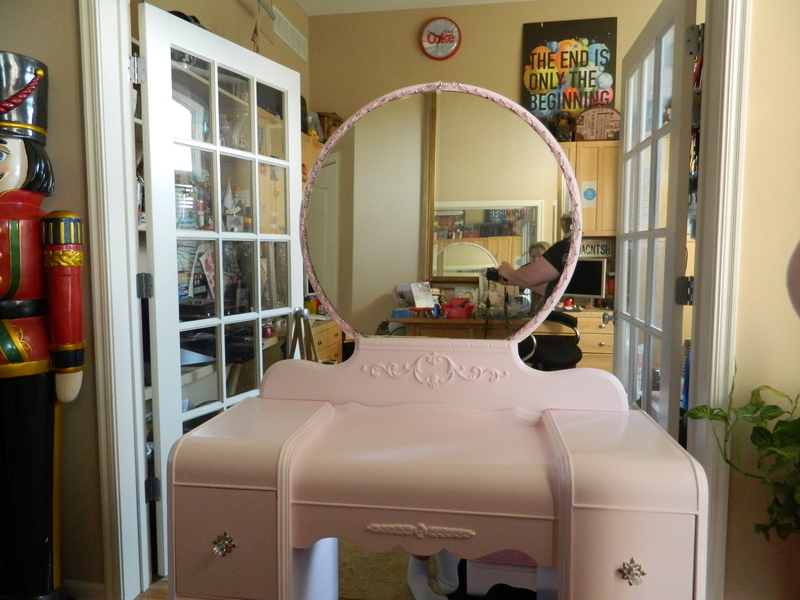 The two dressers were project pieces – the intent of six drawer dresser when I picked it up was to separate it into two smaller dressers, but I think The Kid and I were just getting tired of the work and opted to sell it as originally designed. We did take the smaller dresser and add the trim around the base and the applique to give it a little more oomph, but structurally it is a great piece. 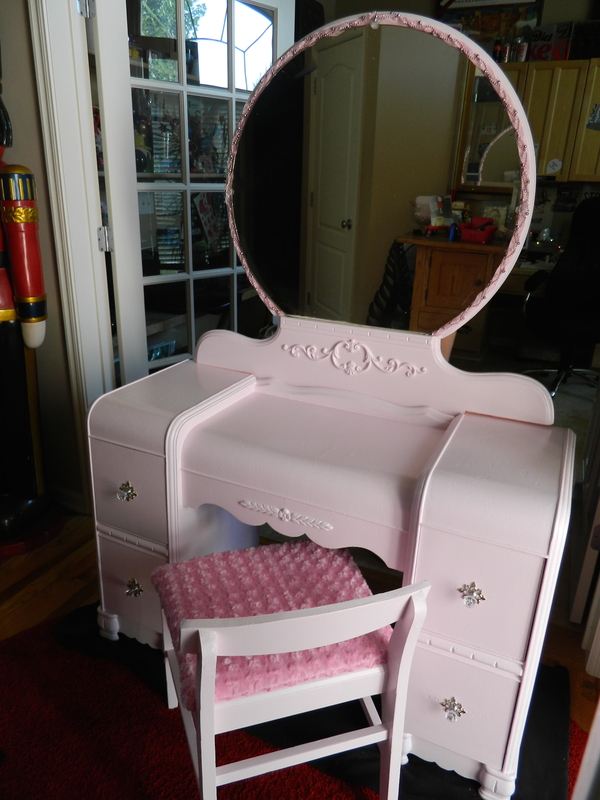 An update to the vanity: I also took an old wooden chair, cut it down, painted it and put the softest pink fabric (I am always amazed at how soft some of the new blended fabrics are!) 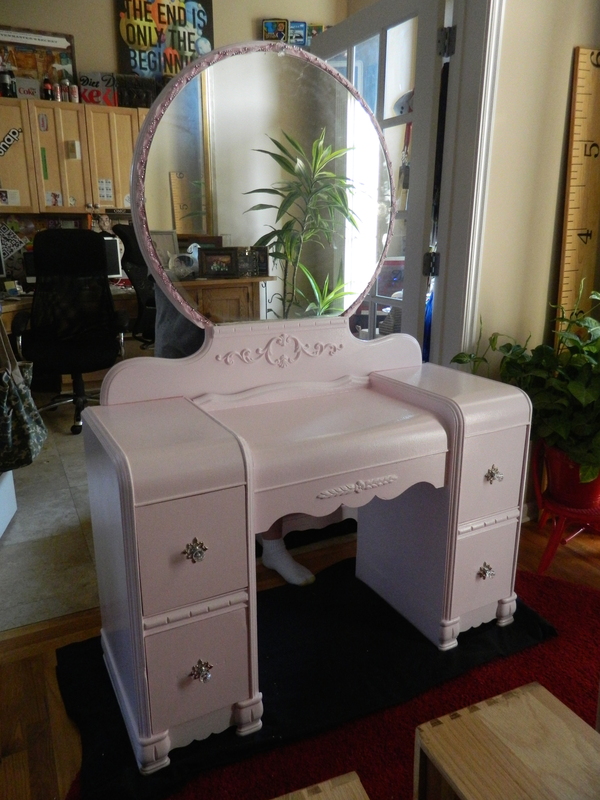 on the seat and added it to the vanity. Perfect! 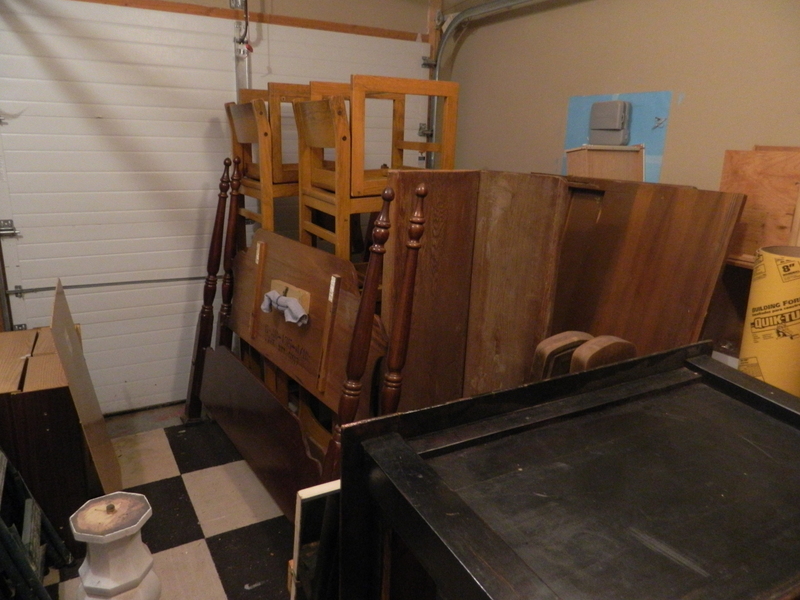 I am getting so bad about not taking the “before” photos as of late. 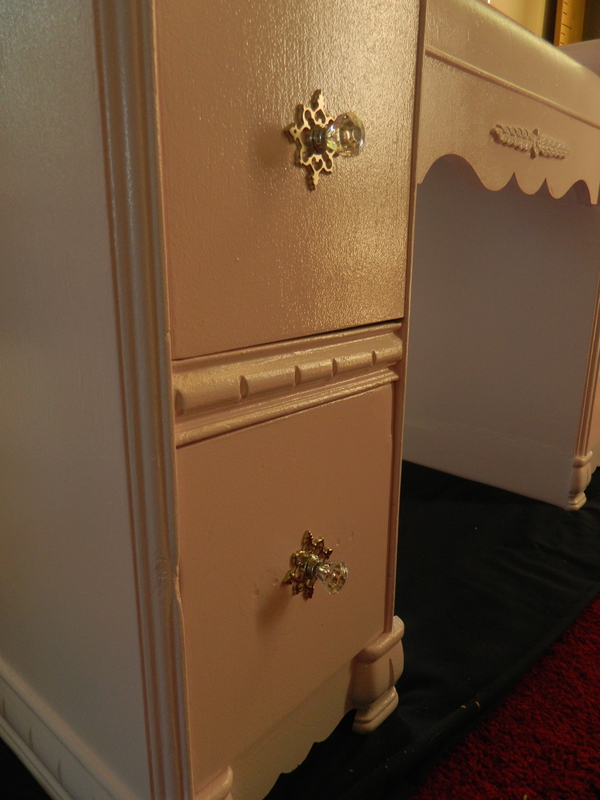 I have one more dresser that is almost completed, and after that, I think I will work with something else for a while. Do you ever get tired of working with a single design/color scheme? I think I am there with the ombré pinks. Even though I have a lot of pink paints left, I think it will go on the back burner for a while. There is one last piece to debut tomorrow and I already have one furniture project well underway. And I’ve been doing some more beadwork. 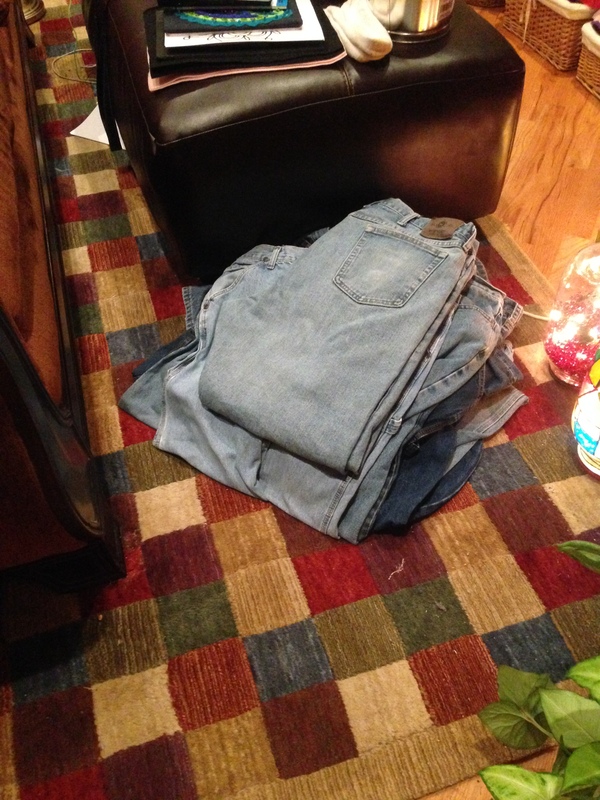 I also have (more than) enough denim to start working on the rag rug. 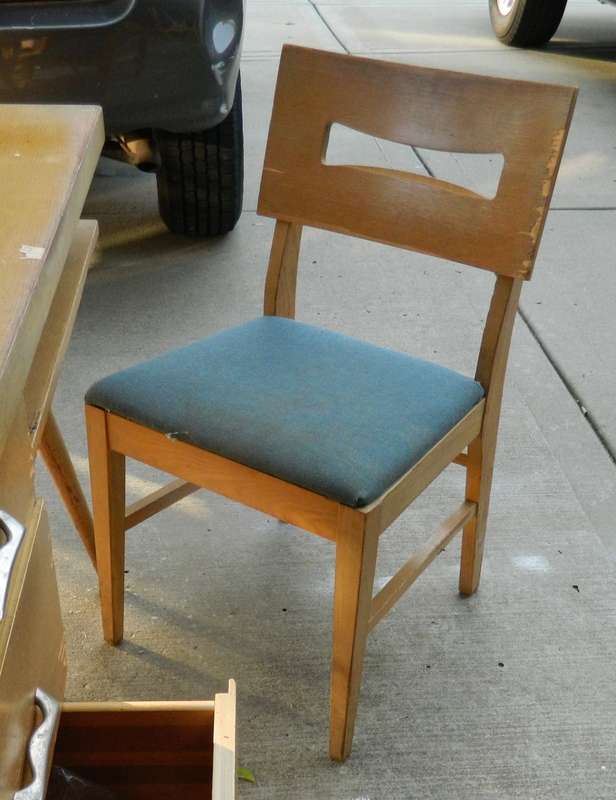 Oh and to upholster three chairs (with denim)! I am going to start with one and see if I can do it and if I enjoy it. 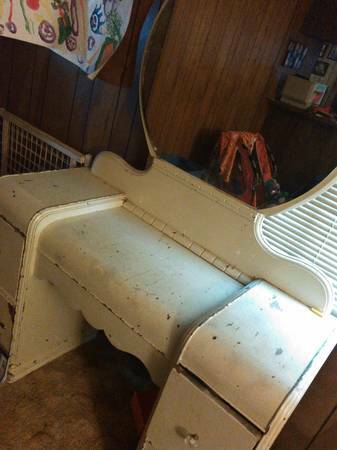 I may just re-give away the other chairs if I find I don’t have a knack for upholstery. Okay, time to ice the knees and enjoy my Sunday! I had a big chunk of this post written when my computer decided it would rather do anything but let me write! So, this is “take 2”. 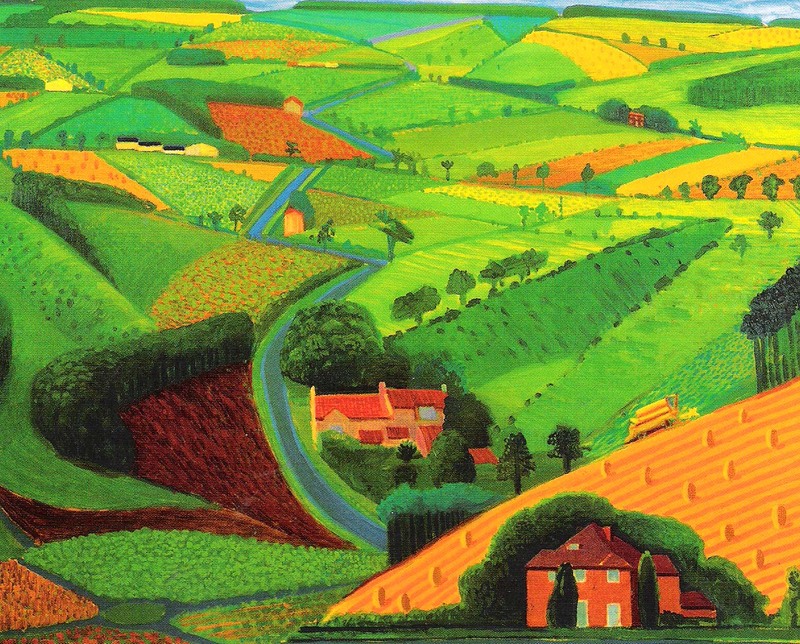 I so love this design, which reached its height in popularity around 1939/1940. These are fairly simply built but usually had a veneer with a nice design. Finding this particular piece was especially nice as it included the mirror. 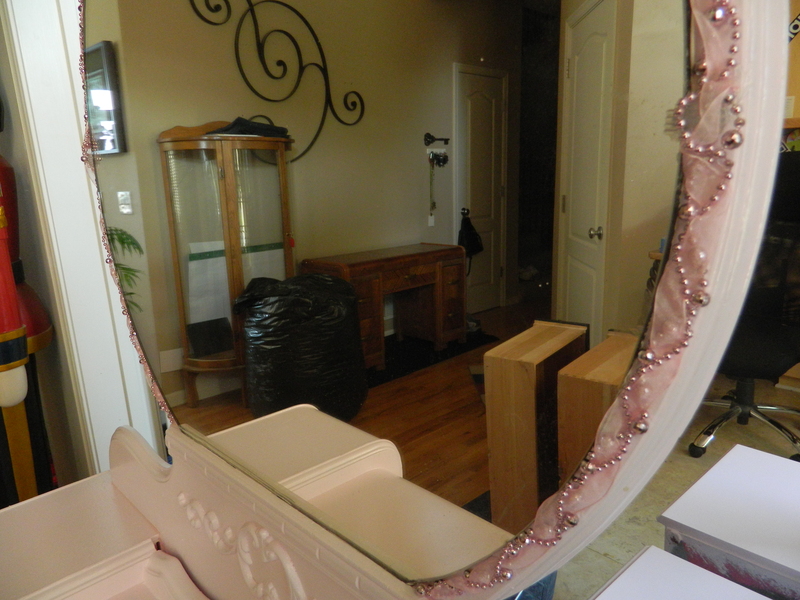 Considering that the mirror is about eighty or eighty-five years old, it is in amazing condition. It did have its faults, though and I will talk about how to deal with them. First and foremost, I attacked the drawers. In relatively good shape, all that was really needed was glue! 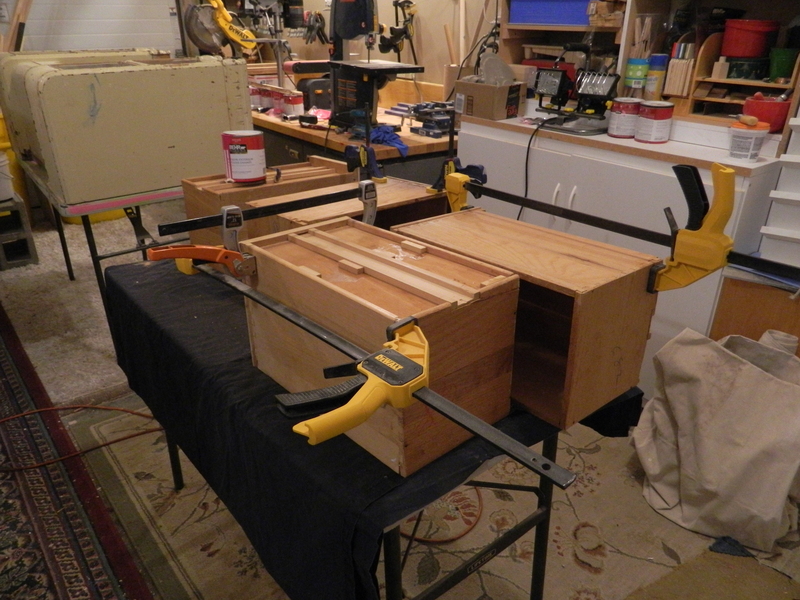 I am so glad that I invested in a large amount of clamps and clamps of varying sizes. Makes work like this a breeze. Next came the cabinet. There were really only a couple of places that needed special attention: there was a piece of trim missing on the inside right cabinet. The other was left front cabinet… almost looks like a puppy cut her teeth on this! And the whole thing needed a good sanding! There was almost a nice veneer under that coat of paint, but it wouldn’t have been worth the effort to sand it down and varnish it. There just were too many dings and marks. But, like you probably know already, I like to paint! And I like to paint with pink! 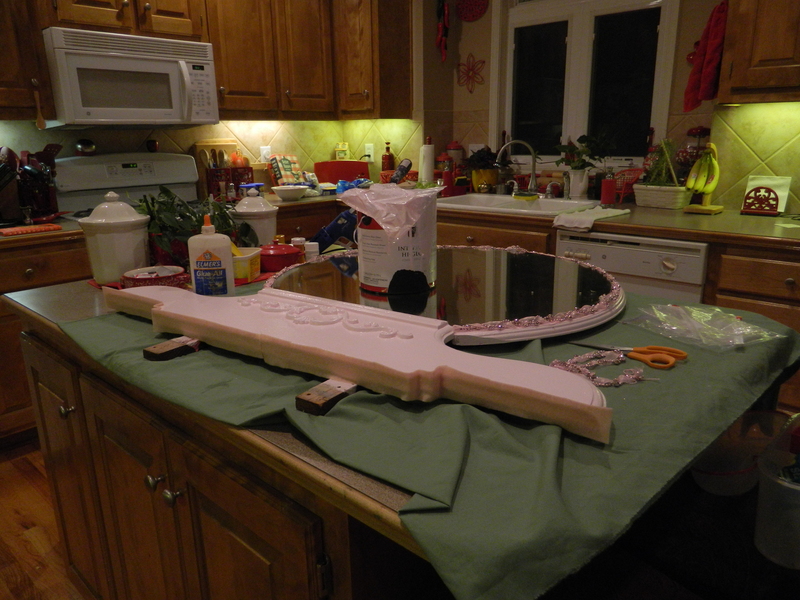 Following the sanding, I prep’d it with my bold pink tinted primer. I really love the way that “mistake” is turning out. I wanted it tinted to go under my pinks and reds, but somehow it turned out super dark pink. But it turns out to have been a blessing in disguise, as you can easily see any areas that you may have missed when you get ready to apply paint! While I worked on the cabinet in the garage, I opted to bring the mirror inside. Just makes it that much easier to work on. Two appliques went on this piece, one on the mirror (you can kind of see it in the photo above) and one on the face of the vanity itself. I love the way that appliques make even the simplest things fancy! Additionally, I found this gorgeous beaded ribbon in pink (found it at Hobby Lobby in their Christmas section. Yes, they are already working on getting Christmas decorations ready!). 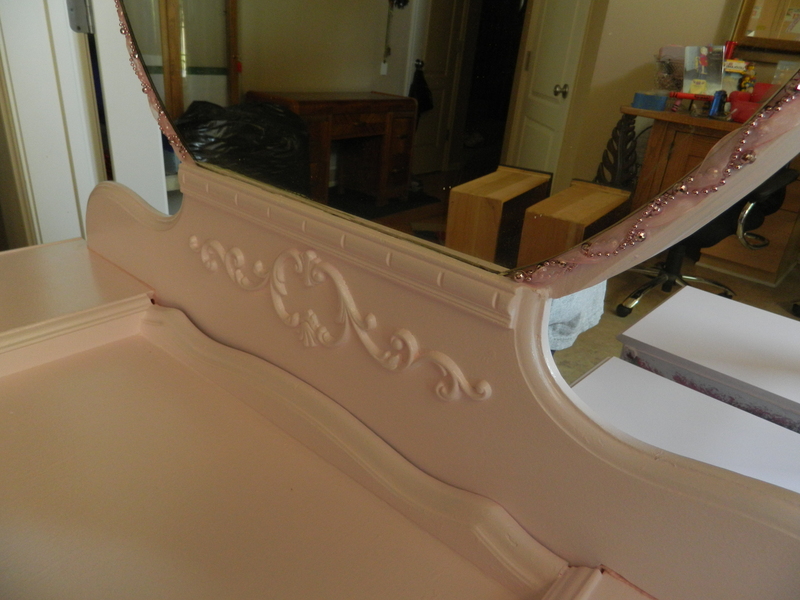 After the mirror frame was painted and then the mirror placed; I simply used glue to hold the ribbon in place. So cute! This photo shows not only the ribbon trim but a closeup of the applique. 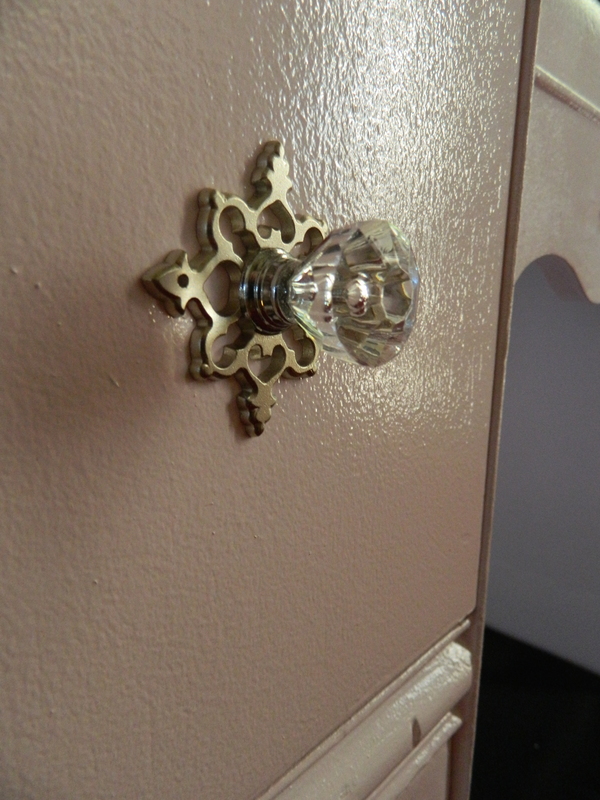 The little wood piece that helps support the mirror is new, to replace an outdated piece of trim. This was actually salvaged from a different dresser. Gotta love that. It is my one chance to show The Kid that I actually do use the pieces I save! The photo makes it look almost gold, but it is silver. I just love little details like this! Well, that’s it! Tomorrow I have another reveal, so stay tuned! The last post I made, I explained how I was conducting a little experiment to see if it would be possible for me to simply live off the money I make “creating”. This week the experiment continues. I had just the most awesome luck last week in running across quality pieces from a number of places. 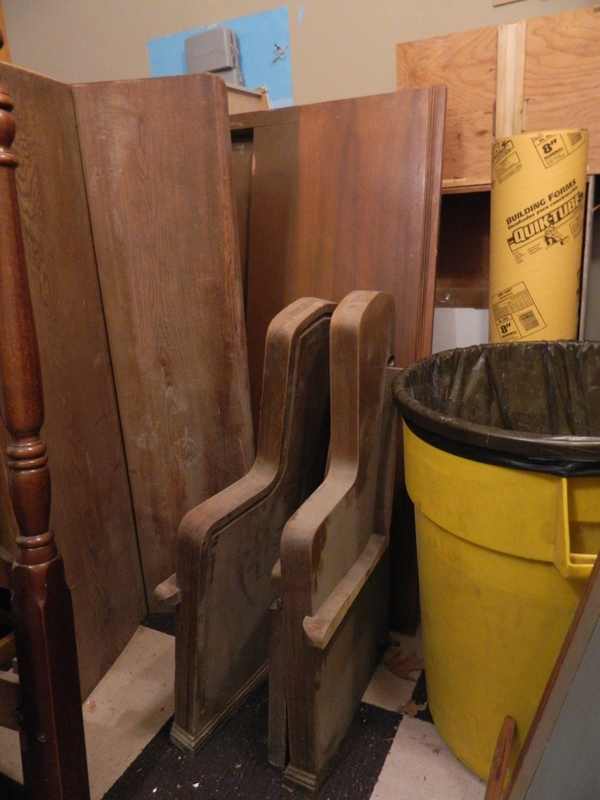 In addition to furniture pieces, we really made out with our ‘thrifting’ trips as well. 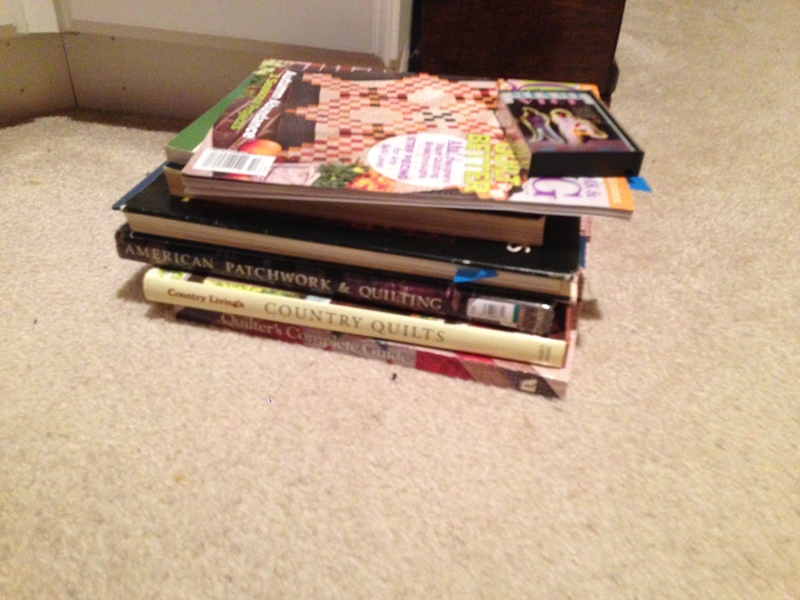 I found a ton of old quilting books, one that dates back to 1949! 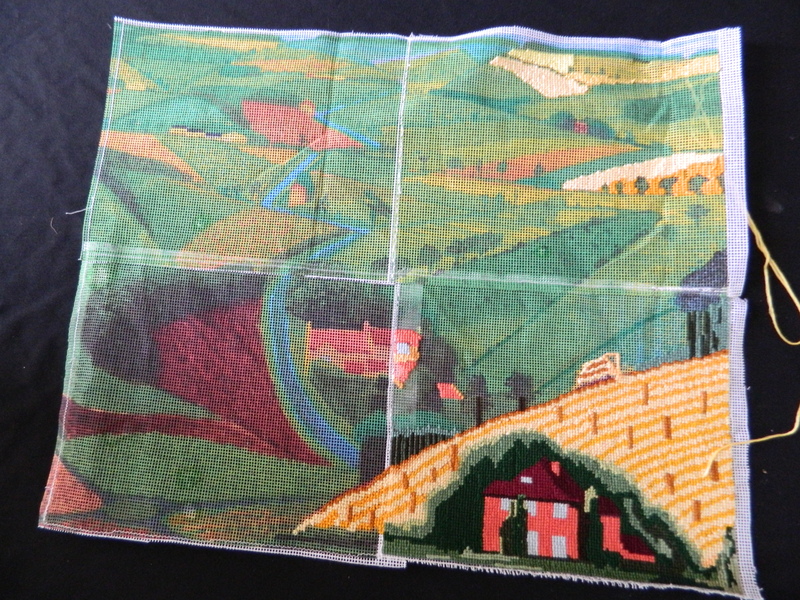 Its really neat to see the way that women used to quilt before the adventure of rotary cutters and our fancy-schmancy sewing machines! Gives me a new perspective on just how good we have it! And one of our favorites just happened to be clearing out their inventory of clothing. $1 for every stitch of clothing in the store. Couldn’t pass on that deal – so yes, I snagged another ten pairs of jeans. I have about a hundred projects going on it seems, but deals like that cannot be passed over! By now I am sure that I have enough denim to make a rag rug at least 20 feet round! 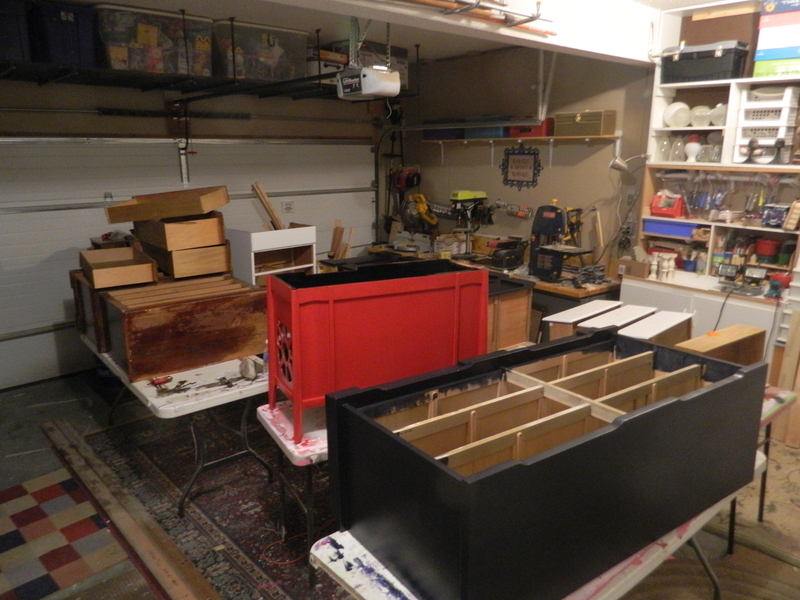 The Kid and I have been steadily working, but with days in the high 90’s and temps reaching into triple digits, it isn’t easy to spend too much time in the garage with heat and the paint and glue fumes. We’re made a lot of progress on quite a few projects in that time, though. I expect to have at least three or four ready for reveal this coming week, but until that I will just leave you with some parting pics! Who said garages were supposed to be for parking your car? Part of our week long bounty. And I have ideas for all of it! Wow, I can’t believe that it has almost been a week since the last post. I knew I needed to take a breather, but when I stopped and looked around, it occurred to me that I have pretty much done nuthin’ for the last few days. I am hot on a binge watching of “The X-Files” (and loving the oh-so-young David Duchovny) and working on the “hee-you-JUH” (well huge for me) cross stitch. I think I “started” this sometime last year after running across the photo in a magazine in my doctor’s office (don’t tell that I stole the mag!) and I think I alluded to this project once or twice in this post. I did manage to get a significant part completed on one (of four) canvases before becoming overwhelmed with the process of connecting the four canvases together. I picked it back up on New Year’s Day, just to keep my hands busy while The Kid and I (that’s for you Jennifer!!) started the marathon. I am vowing to work on it at least a little every day, and maybe, just maybe, I will be able to show you the finished work next New Year’s!! 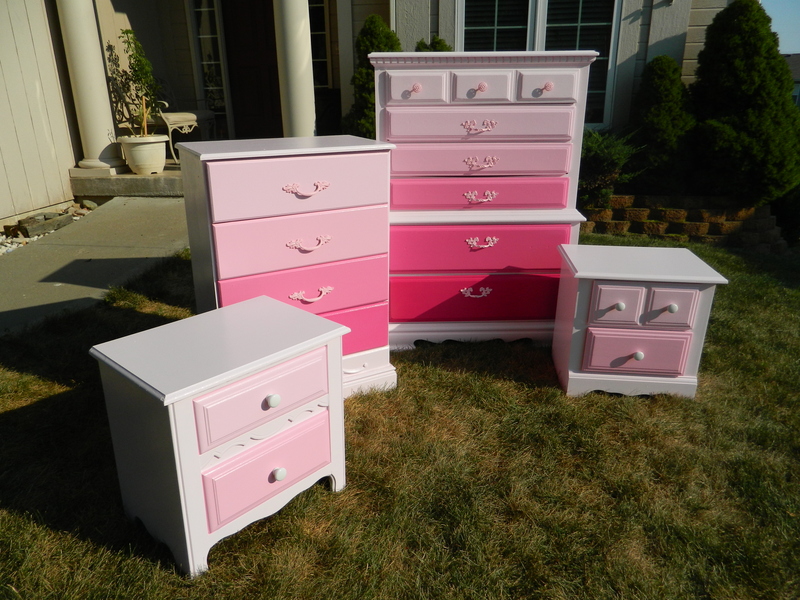 I did sell three pieces on Craigslist, the pink pieces I did. I met a nice gentleman who is very good at talking me down on my prices. Grrr. Not a fan of that. Especially since he mentioned on one piece he was planning to repaint. I really don’t care what people do with the pieces once the buy them, but I don’t wanna know that my hard work is soon to be erased.